Green building is rising in popularity exponentially. Owners of existing construction are leaning that way during kitchen remodeling projects and bathroom updates. What about new home construction? For anyone securing a construction loan for new home, this is a shining opportunity to build green while tightening the screws on ballooning energy bills. And that is where framing the homes envelope with insulated concrete forms (ICFs) enters the picture. It goes without saying that framing with SIPs (Structural Insulated Panels) are a green way to construct a home that has a virtually air-tight envelope. This is what makes it energy efficient to the nth degree. There is virtually no air flow from the outside finish to the interior through the walls, due to the assembly method. Also, the insulating materials that are sandwiched between the OSB (Oriented Strand Board) yield high-efficiency radiant energy insulating qualities. 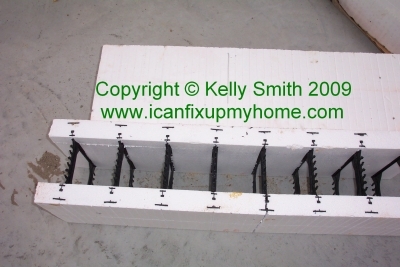 In a similar fashion, ICFs (Insulated Concrete Forms) deliver similar energy efficiency. Interested? Sustainable building design and construction with ICFs can add up to 26 points toward LEED (Leadership in Energy and Environmental Design) certification on a residence or commercial building. The LEED process is similar in nature to Energy Star Certification. Not only is meeting the score in energy conservation on reducing energy bills important, its a huge investment in your home equity. The term ICF is self-explanatory: they are insulated concrete forms. They begin with a hollow foam block made of Styrofoam (otherwise known as expanded polystyrene or EPS). The hollow space between the Styrofoam is the container for the wet concrete mix that will eventually form the structures walls. Its important to consider the homeowners insurance benefits of concrete wall construction. Residential architects use construction software to engineer the individual blocks that make up the residence. From this process emerges the blueprints with the design specified so that a minimum of job site cutting and modification will have to be done. The sizes are standardized as 12, 16, or 24 tall. The foam sides are usually specified as 2 to 2 3/4 thick, depending on the insulating R-value needed. When the architect is done with the design, the ICF manufacturing facility builds them and ships them to the building site. At that point, the general contractor may utilize construction project management software, depending on the size of the construction project. As with tilt-form construction used on large commercial projects like malls, exterior walls are commonly carefully plumbed and then braced while the concrete is poured and is curing. After the concrete walls have cured sufficiently, the bar joists or trusses are added. These ensure that the walls remain sturdy and plumb while the temporary bracing is removed from the walls. Just as with residential wood framing, there are a vast range of choices for finishing the outside walls. In many cases, commercial structures like strip centers are finished with an acrylic stucco mixture. This finish is troweled on over Styrofoam attached to sheathing and structural grade metal studs. But when ICF block technology is used, the foam insulation is already in place! Saving steps saves money, bottom line. On residential buildings, wood and aluminum siding are typically used, although Acme brick veneer is also popular. The home is now extremely energy efficient due to the fact that theres an encapsulated interior and exterior layer of insulating foam. Easy to build radius walls, which are problematic with conventional wood framing. Concrete is very strong structurally, so ICFs are a natural choice for locations that are susceptible to wildfires, hurricanes, and tornadoes. Theyre quick and efficient up to get up out of the ground and dried in because of the linear and streamlined construction process, from drawing board to house-warming party. Excellent insulating qualities providing up to an R-25 efficiency rating. Virtually no job site cutting or modifications, which minimizes waste and saves money. Less scrap trucked to the landfill means points towards LEED certification. ICFs are a green building practice!